Wallaby joey peeks out of the pouch. Photo by Dennis Dow/Woodland Park Zoo. …and a nearly 4-month-old wallaroo who is giving us a whole new perspective on what goes on inside the pouch. What we've seen will amaze you. Let’s take a closer look at the developmental stages of the two joeys. A hand, an ear, a nose—for the last few months, we have kept a close eye out for any sign of the latest wallaby joey emerging from its mother’s pouch. Born the size of a lima bean back in October, our newest wallaby joey has finally begun to peek out! You can see it still has quite a bit of developing left to do. Soon the joey will grow in a furry coat and spend more time peeking out. As we head into summer, we’ll see the baby eventually begin to take little trips outside of mom’s pouch, returning for feedings. Here’s where things get awesome. 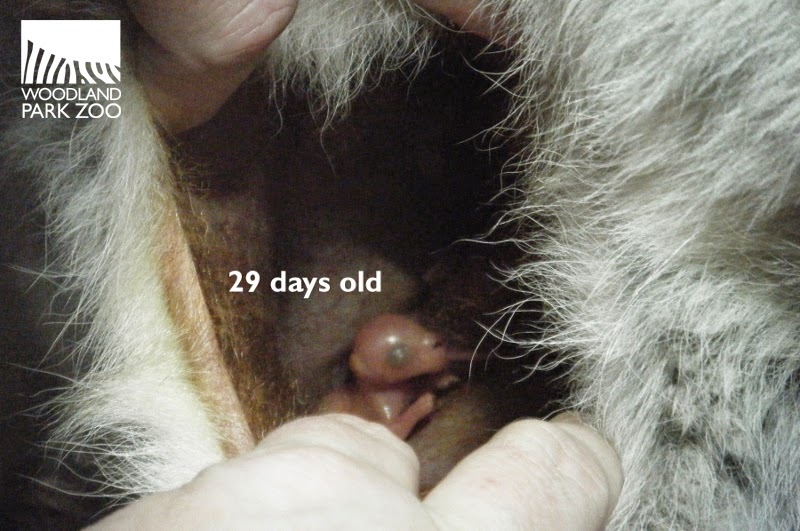 Another joey—a wallaroo born in January—isn’t quite at the same developmental level as the emerging wallaby joey. 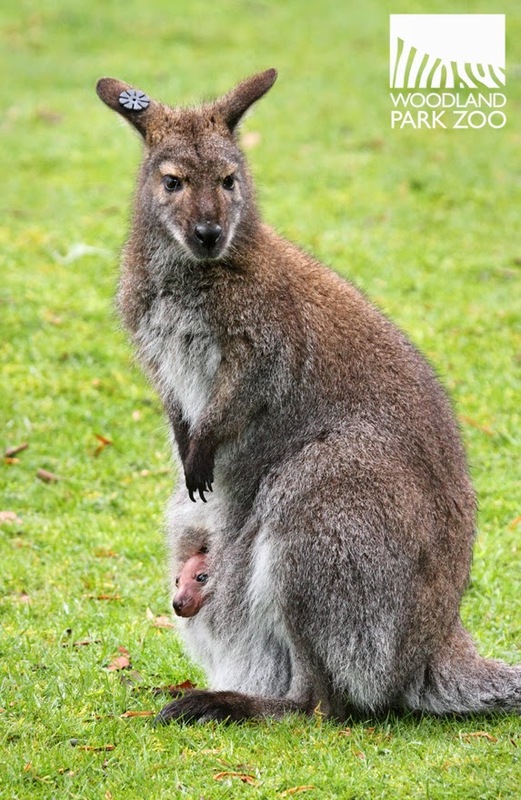 The wallaroo joey is still tucked away securely in mom’s pouch. But our dedicated zookeepers have been doing pouch checks during the joey’s first few weeks to keep an eye on its development and to document the little-seen earliest stages of a joey’s life. It all starts with trust. Keepers have been working with wallaroo mom, Tullah, to get her comfortable with up-close, hands-on care. This means that when it’s time for medical exams or special care, Tullah is already at ease in the presence of her keepers. Without this early training, the pouch checks would never have been possible. 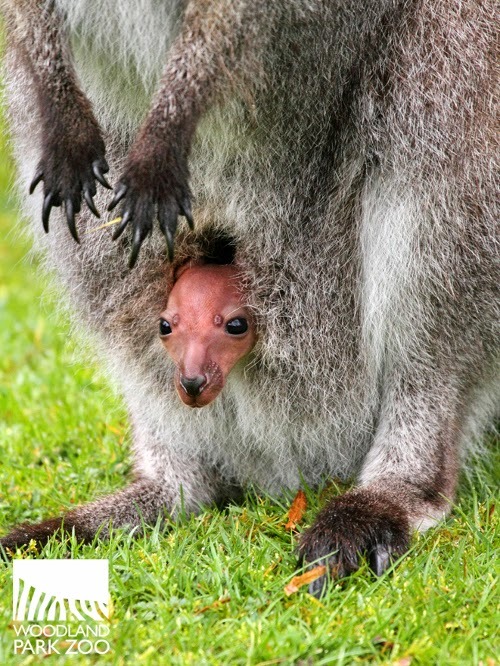 Zookeeper Wendy Gardner began the pouch checks when the joey was just under 2 weeks old, and has continued to do them about once a week throughout its development. The system is simple, but has yielded amazing results. Wendy and her fellow keeper, Allison Barr, head into the wallaroo’s indoor den and offer Tullah a favorite treat—yam. Even this step took some experimenting to get right. Yams cut too small made Tullah more likely to hunch over while eating. A lengthy slice encourages her to sit up while munching, putting her in the perfect position for a pouch check. Wearing a headlamp for illumination, Wendy gently touches around the pouch and then eases it open slowly to get a look inside. The headgear sheds light on what’s happening inside the dark, warm and humid pouch environment. While Wendy holds the pouch slightly open, Allison snaps photographs and the two observe the joey’s latest developments. They are looking to see that it is growing steadily, and also tracking what has changed. For example, fingers that were a fleshy blob at first started to become distinct digits in later weeks, and by day 55, keepers could see little nails forming on the fingers. Shedding new light on these earliest stages of development will ultimately help scientists better understand a species that is so unlike our own when it comes to infant development. Wendy and Allison hope to eventually document and share their findings with others to increase the body of knowledge out there and help shape best practices when it comes to the care of these fascinating animals. I has chance to visit the Kangaroo Ranch in Fall City last year....the owner was so good at educating me on wallaby reproduction. I knew about the fetus crawling up into the pouch to finish developing, but I had no idea about how an embryo can be kept in stasis until the mom is ready to give birth. Or, that she can produce two different milk formulas...one for a joey at heel and another for a new baby in the pouch. Amazing creatures! I am disturbed that the keeper is not gloved during these exams, and the risk of exposing the joey to potentially harmful foreign bodies. We appreciate the concern but want to assure you that keepers employ excellent hygiene in every aspect of their work. Gloves are not necessary for this sort of task.